​The 'Halloween' card and envelope are shown on the right. Click the images to expand. ​Three months after the 'Little List' letter, on October 27th 1970, the Zodiac Killer mailed the 'Halloween' card to the San Francisco Chronicle. 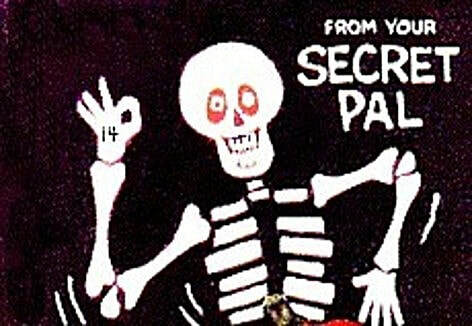 The main focus of the correspondence appeared to be directed towards Paul Avery, a reporter at the San Francisco Chronicle newspaper and came in the form of a 'Halloween' card, depicting two skeletons. The word 'paradice' is crossed with 'slaves' to form four corners, where he placed the wording By Fire, By Gun, By Rope and By Knife, three of which he had definitely used in his four confirmed attacks. If we include the Modesto Abduction of Kathleen Johns on March 22nd 1970, then all four were relevant. The card also contained the phrase "peek a boo you are doomed", a sort of veiled threat. On the face of the card, added onto the skeleton's hand, was the number 14, possibly inferring Paul Avery was to become his 14th victim. 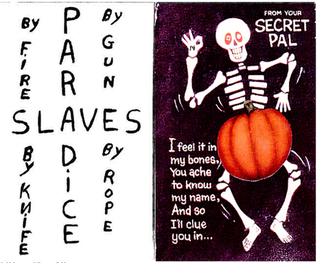 It must be stressed that the writing on the front of the card was not added by the Zodiac Killer, only the pumpkin. Neither was "But, then why spoil the game. Happy Halloween". phrase on the inner. The eye in the tree knothole was not added, with the rest of the card inner added by its author and designer. The 'Halloween' card envelope, either deliberately or inadvertently, contained the misspelled name of Paul Avery to Paul Averly and the LAV section of his name had been underlined. On the inside of the envelope (shown below right) the author of the card had included the phrase "sorry no cipher" twice, configured in an X formation. However, whether or not a hidden message exists in the 'Halloween' card is debatable. 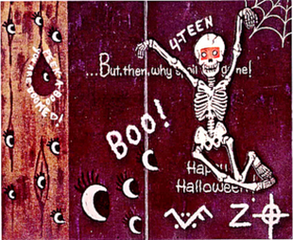 Many theories have been put forward to the meaning of the symbol on the 'Halloween' card envelope and card itself. The Zodiac Killer throughout his correspondence often declared how many victims he had claimed for his afterlife, so quite simply the symbol could stand for ZVF, indicating a total of Zodiac Victims Fourteen, with the four dots alluding to this fact. The 'Little List' letter was mailed by Zodiac on July 26th 1970, and the '13 Hole' postcard on October 5th 1970, both of which claimed 13 victims. The latter of which held the same victim count because the 'Little List' letter was not published in the newspapers at the time it was received, forcing the murderer's hand in releasing a second communication repeating the same total. The '13 Hole' postcard claiming a 13th victim meant this could not be Donna Lass, who disappeared on September 6th 1970 from the Sahara Tahoe Hotel and was believed murdered. The 13th victim was claimed by July 26th 1970, just over a month before the disappearance of Donna Lass. ​Zodiac would ultimately infer his involvement in the Lass disappearance, mailing the 'Pines' card to Paul Avery on March 22nd 1971, six and a half months later. If he truly was responsible for the abduction and murder of Donna Lass, then she had to be Zodiac victim number 14, as depicted on the October 27th 1970 'Halloween' card. It would have been seven weeks after her disappearance, so the choice of skeletons coinciding with Halloween may have been more by design than chance. Other than LASS being present in SLAVES there is little else within the card to imply a connection to her murder. However, if Donna Lass was the Zodiac's 14th victim, then the idea this card was a veiled threat to San Francisco Chronicle reporter Paul Avery is a misguided one. 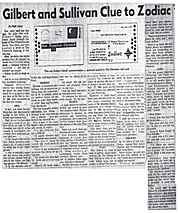 Below is the October 12th 1970 San Francisco Chronicle article that released details of both the 'Little List' letter and '13 Hole' postcard. Often with Zodiac correspondence he is responding to newspaper articles he has read. Two examples were the 'Debut of Zodiac' letter received by the San Francisco Chronicle on August 4th 1969, which was a direct response to two articles featuring Chief Jack E. Stiltz on August 2nd and 3rd. The 'Bus Bomb' letter on November 9th 1969 was again a direct response to Chief Martin Lee, who claimed Zodiac was not hiding in the Presidio Park and had made several mistakes. In both cases the Zodiac supplied extra details about his crimes. Click to enlarge. Once opened click again to magnify. The 'Halloween' card was likely in part a response to the newspaper coverage of the Bay Area murderer . The previous newspaper article in the San Francisco Chronicle prior to this card arriving was entitled 'Gilbert and Sullivan Clue to Zodiac', authored by Paul Avery on October 12th 1970. Therefore, it possibly wasn't a surprise when this letter addressed to Paul Avery arrived with the chosen wording "I feel it in my bones, You ache to know my name, And so I'll clue you in". 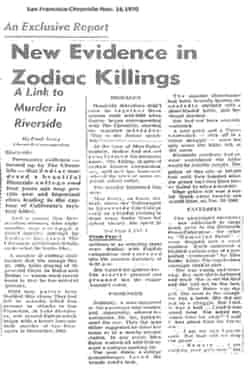 There are other pointers in the San Francisco Chronicle article, although less convincing, such as where Paul Avery writes "Homicide detectives who've been hunting Zodiac for nearly two years frankly admit he is as much an enigma now as he was on December 20th 1968, when he chalked up his first two victims". But whether Zodiac's stylized chalk writing, including the total '4-TEEN,' was a direct consequence of the wording in the newspaper article is a matter of opinion. ​The article pointed out how the 'Little List' letter mailed on July 26th 1970 plagiarized two acts of Gilbert and Sullivan's The Mikado. The Zodiac wrote "peek-a-boo" around the knothole of the tree. The British term for peek-a-boo is peep-bo, and peep-bo is a character in the Mikado. This again is a stretch, we may never know. There are many articles by Paul Avery, but the 'Halloween' card was the first one personally addressed to the San Francisco Chronicle reporter, so it may be likely the October 12th 1970 article was the trigger. View October 12th 1970 San Francisco article. Click article once opened to magnify. Two excellent discoveries regarding the Halloween Card can be found on Zodiac Killer Site Forum. The 'Halloween' card was widely assumed to be a direct threat towards Paul Avery, a reporter at the San Francisco Chronicle. Paul Avery found links indicating the Zodiac Killer may have been responsible for the murder of Cheri Jo Bates in Riverside on October 30th 1966, and to which the Zodiac either laid claim to, or part indicated his involvement in, by later stating "I do have to give them credit for stumbling across my riverside activity", when he mailed the Los Angeles Times Letter on March 13th 1971, five months after this card was received. Whether or not the 'Halloween' card was misinterpreted is open to question, as no threat ever materialized, albeit Paul Avery took no chances in the following months, arming himself at all times with a .38 revolver. Paul Avery was also heavily involved in the reporting of the kidnap of Patty Hearst (19), a newspaper heiress taken hostage on February 4th 1974 by the Symbionese Liberation Army, an urban militant group. She was later to be viewed as a sympathizer for the group after her involvement in a bank heist, along with other SLA members. She was filmed inside the Hibernia Bank, 1450 Noriega Street, San Francisco on April 15th 1974 brandishing a M1 Carbine, appearing a willing participant in the crime. She was later jailed for two years before being pardoned. A letter, believed by many, to have been authored by the Zodiac Killer was mailed on February 3rd 1974 from Los Angeles County, one day before the kidnapping of Patty Hearst. According to the FBI files, it wasn't received by the San Francisco Chronicle newspaper until February 14th 1974. This short, seven lined letter is widely referred to as the SLA Letter due to the mention of the Symbionese Liberation Army within the correspondence. It is extremely likely this communication was written by the Symbionese Liberation Army or somebody in close alliance with them. The S.L.A letter began with "Dear" and ended with "a friend". Seven days later, a typed correspondence was mailed by the Symbionese Liberation Army, on February 10th 1974, and addressed to the Hearst family. It too began with "Dear" and ended with "A friend". CLICK HERE TO SEE A REPRESENTATION OF THE WORDING BY FIRE, BY GUN, BY KNIFE AND BY ROPE REVEALED IN THE 340 CIPHER. See the 340 Cipher page for PARADICE and SLAVES connection. Comparison with the 340 cipher. Click to enlarge.